Slow-cookers, also known as crock pots, have become a very popular countertop appliance for the kitchen. They are a highly convenient and easy way to make delicious home cooked meals just like your granny used to, with minimum effort. Usually with two or three heat settings – low, medium and high – you can simply chop up your ingredients, add them to the pot and leave them cooking, so your dinner is ready when you get home. They can be used for all sorts of dishes, from soups and stews to roasts and desserts. A standard model is comprised of a round or oval slow cooking pot with a lid. They are generally made from ceramic or porcelain materials with a metal casing and glass lid. Inside, your ingredients are cooked at atmospheric pressure – not to be confused with pressure cooking. There is no risk of a sudden pressure release with a slow-cooker. Our team of savvy experts have tried, tested and reviewed dozens of models. We’ve listed our pick here so you can easily make a decision about which slow cooker to purchase next. Retro slow cookers are unfortunately hard to come by, so this offering from Swan (a.k.a industry leaders in the retro look) is a winner if you really care about your aesthetics. The removable inner pot is good when you want to take it straight to the table for everyone to help themselves. It is also dishwasher safe, for an easy cleanup. There is a 32-page recipe book included, which you can use for a bit of inspiration if you’re stuck on what to make. We liked the idea of the auto setting, which starts the cooking off on high then drops it to low when ready, so it is perfectly cooked without you having to bother. This is perfect for stews and soups. There is also the low setting for any pudding or porridge or a high setting for pulses. There is a choice of three sizes, which is brilliant. The 1.5L is ideal for one or two people, and the 6.5L is a huge titan of a slow cooker which could quite easily feed half a dozen people or more. A couple of the accessories are a little flimsy, such as the lid handle or dial, but they still do the job. The sheer choice of colours will definitely appeal to you if you like to step away from the neutrals and blacks. Forget the usual light blue and green retro looks – you also have grey, red, orange and lime green if you’d prefer a pop of colour. It is a great match if you have other Swan retro appliances, or are fussy about the size you are wanting. The price is pretty relative to what you get, too, with each option. 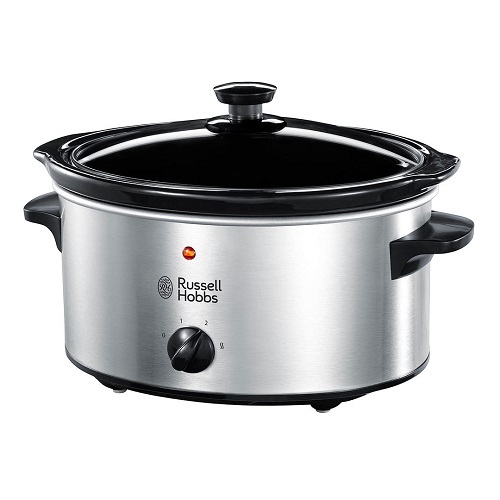 A lovely affordable and quirky slow cooker for those who like to make mealtimes fun. The matt black coating allows you to do what both the name and the picture suggest. You can write on it with chalk, which could come in handy more than you’d think. Whether you want to leave a note for the family to say what is cooking, tell them not to touch/stir/turn it off, or keep track of the ingredients you’ve added/need to add and timings, all the data is in one place. The 3.5L capacity will make enough for around four portions, so you have a pot which is big enough to get a few meals out of or keep everyone happy at dinner time. A glass lid lets you keep an eye on things before it is ready, so you don’t have to keep removing the lid and releasing the heat. Shape-wise, the taller design means it is a bit less wide than a lot of others on the market. Therefore, if you have a small kitchen, you won’t need to take up a ridiculous amount of space when it is in use. It isn’t the most reliable when it comes to results. When we cooked with chicken breasts on both the high and low settings, it all broke up into smaller stringy segments. It also seemed a little too powerful on the slow setting for our liking, with liquids starting to bubble almost straight away. But for the price, it is a good, fun offering for anyone who needs the convenience every so often. Ignore any other dated reviews which state that the sticker leaves behind a sticky residue when removed – we can confirm that Russell Hobbs have taken this feedback on board, and ours was left spotless. A basic and affordable slow cooker, yet one which still does a fab job in getting your dinners served with minimal effort. It is 3.5L, so great for a small family. There are two heat settings, high and low, so whether you need a casserole in less than three hours or want to keep your tagine bubbling over while you are at work, there will be perfect results in the end. The stainless steel outer and glass lid makes it a stylish addition to any kitchen, and even though it is not a particularly starry-looking item, this actually makes it quite nice in a way. You just have a simple dial for your control, so there is no fuss and messing about. It would make a brilliant first slow cooker for your home, and there are so many online recipes which you can follow for inspiration. The included booklet also gives you many basics, as well as easy instructions to follow. The inner cooking bowl is removable from the base, so you can take it straight to the table and wash it all up afterwards. All of the ingredients came out perfect in our tests too, from meat to hard carrots, so stress is at a minimum. Nothing bad to say for this price! Perfect for any recipes, from stews and casseroles to soups and puddings, this is a slow cooker which can handle every meal, from the hearty traditional ones to the adventurous concoctions. We would expect no less from a name such as Crock-Pot, who are the kings of the slow cooker world. It is nice and easy to use, thanks to a digital screen which gives you full control over timings and settings. Don’t worry about the cleanup either, as it is simple to wipe clean and pop away. The last thing anyone wants after dinner is to spend ages washing up, after all. There is also a rubber seal around the lid, so no moisture is lost during cooking. This will please anyone who gets annoyed by dripping condensation when they go to stir the food. Another feature which prevents this is the hinged lid. You don’t have to scramble to get a cloth down to set the lid on anymore, or struggle with oven mitts and tea towels as it is too hot. Great for that last-minute adding of spices. It can be removed if preferred, or for cleaning. As it is 4.7L, it is great for families or anyone who wants to cook a meal which will do them a couple of times. Another of our favourite Crock Pot offerings, and this is one of the largest capacity slow cookers on offer, so great if you have a lot of hungry mouths to feed. The removable die-cast pot lets you take it straight to the table, and is also easy to clean up afterwards. It can also be used on the hob which is handy, so you can seal meats or saute ingredients before starting the slow cooking. Think we can all agree this is much easier than transferring it all from a frying pan – we all love minimal washing up. The DuraCeramic coating is four times more durable than a standard non-stick coating. As well, both the pot and lid are oven, fridge and freezer safe. This gives you countless opportunities to make the meals you want, how you want. With a keep warm function, you can ensure everyone is ready before you settle down, without risking spoiling the food. When it comes to the cooking, the digital timer counts down the hours and minutes left so you can keep an eye on proceedings, and then automatically switches it to warm when done. Moving on from the actual cooking performance, the digital screen is nice and clear to see, and we love how it looks a little different too. Gloss white provides a change from the usual blacks and stainless steels, and the cast aluminium material will keep it strong and scuff free. This is a small cooker which will have your back for years to come and will create delicious meals without any fuss from you. Well worth the investment. Crock-Pot is the original and best-known brand of slow-cooker, launched in North America in 1971. The stoneware inner pot is removable with a rinse-clean coating, so you can clean it easily and even put it in the dishwasher. The lid is tempered glass with cool-touch handles – this is a very useful feature to look out for as it allows you to touch the appliance without burning yourself. To reheat leftovers, you can simply remove the lid and put the pot straight into the oven. Our only gripe with this crock-pot is that there is no signal light to let you know that it’s working – so for the first few minutes it’s hard to tell if anything is happening. However, you soon find out when the pot begins to heat up. This no-frills 2.4 litre model is well suited for one or two people and has two simple settings – high and low – depending on how quickly you want your food to cook. It could be anywhere between 2-10 hours. This small appliance is the perfect cook for all of your family with its large pot that can accommodate up to five litres of your gorgeously stewed recipes. The concept is one that’s been met with great enthusiasm from many customers and subsequently slow cookers are growing in popularity, this crock-pot in particular is one that’s received some great reviews for its auto keep warm function. Crock-Pot are the pioneers of the original slow cooker and that shows in the creation of this item with it’s full-circle of technology and features. It provides a digital display with a countdown, an irrepressible pot and different heat settings. The fantastic thing about this slow cooker is its auto warm feature that means you can rest assured when leaving your meal cooking all day, it doesn’t overheat or burn it just keeps it warm for your return. Despite it being more expensive than the entry-level products that you now see in many big stores, this large pot is one that is well worth its money. A lot of product for your money here with the display, settings, removable lid, spacious pot and different qualities. It holds 6.5 litres, which will make several portions of food. You can easily fit a whole chicken or leg of lamb into this appliance, and it will come out incredibly tender and falling off the bone. It’s also great for stews, casseroles, curries and all the usual recipes. This Morphy Richards model has a toughened glass lid and both the bowl and lid are perfectly fine to go in the dishwasher. You can also place this straight onto the table to serve. This model also looks really nice, with a polished stainless steel outer casing and oval shape – the perfect shape for slow cooking bigger cuts of meat. This is the perfect family slow cooker, and the biggest (in terms of capacity) on our list. 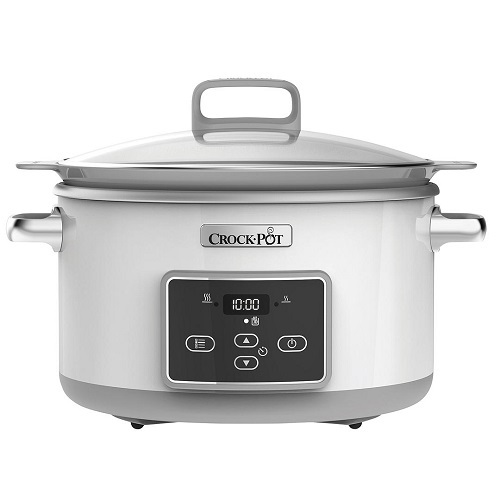 Its capacity is similar to the aforementioned Crock-pot, but this option is programmable, like the Andrew James model. Its delayed start function lets you choose the start time, and it has an automatic keep-warm function once it’s finished slow cooking, so your meal is still hot – but not overcooked – when you come to serve it. The inner bowl is non-stick and is removable, therefore easy to clean. It is also dishwasher safe. This model comes with a free recipe booklet to give you some inspiration – from slow cooked chilli to porridge. The Tefal Multi-Cooker is really much more than just a slow cooker, as it has other functions as well, including rice cooking, steaming and even baking. This slow cooker is one of the industry favourites and has been created for simple use, it’s easy to utilise the features, easy to clean and can be used for a whole host of meals. Crock pots have become increasingly popular for good reason with them being versatile and hassle-free but Morphy Richards have again exceeded all expectation with this red innovative product. You can sear, stew or slow cook in this appliance and it adds a new dimension to your kitchen capabilities, simply put on the food and leave it to soak up the flavours and slowly reach completion. This particular item is one with three heat settings, a lightweight design and a non-stick aluminium pot. You can cook and serve from the same pot plus washing is made super simple with the removable pot that can be washed in the sink or dishwasher. It boasts a capacity of 3.5 litres and serves up to four people ensuring that you can make food for the family without stress – it contains a durable design and has a transparent, tough lid perfect for checking over your brewing recipe. It’s perfect for everyday use and has been created to go the distance with a resilient yet functioning structure that makes for ideal use, capitalise with the removable lid, detachable inner-pot and has different cooking options for stews and soups. A simple, easy to use option for everyday use. Compared to other kitchen appliances, slow cookers are actually on the cheaper side. They are more energy-efficient than ovens, and allow you to use cheaper cuts of meat because the slow cooking tenderizes them so well. Depending on the model you choose, you should expect to pay anything from £15 to £80 for your slow cooker. On the more expensive end, what you’re paying for are the extra features, things like a searing function, digital controls and timer options. For some these are highly useful, but they are not necessary for everyone. The basic models will still serve you well for a tasty stew or casserole. If you’re going to be using your pot to do lots of family cooking, or if you like to cook in bulk, then a 6-litre pot is a good size to aim for. If it’s mostly just the two of you, you could make do with a smaller pot of around 3.5 litres. The right shape for you depends on what you will mostly want to use the appliance for. Round models do a better job at cooking stews and curries, so if you will mainly be using it for these then you can stick to a round pot. However, oval pots are a better choice for cooking a whole chicken or a rack of lamb, for example, as it’s an easier shape for fitting in these large pieces, and it will work perfectly fine for a stew as well. There are two variations of slow cooker – digital or manual. A digital modelis one that allows you to choose and program your cooking time. These often have a keep-warm setting that they switch to when the timer ends, so you don’t come home to a cold dinner. Manual cookers are more simple – you just switch it to the desired setting – high or low – and it will keep going until you turn it off. With manual cookers you shouldn’t really leave them, so if you will leave it running all day you would be better off with a digital option. Most crock pots are ceramic, porcelain or metal, which are all good at conducting heat. A lot of it is down to personal preference. The main thing is to find one with a removable pot, as it makes cleaning much easier. If you use a dishwasher, make sure it’s dishwasher-safe. Transparent glass lids (avoid clear plastic) are also preferable, as it means you can see how the food is getting on without taking the lid off and letting the heat out. What Is The Temperature A Slow Cooker Can Reach? With a slow cooker you simply set the temperature to low or high. There are no degrees or in-betweens – it either cooks quickly on a high heat or slowly on a low heat. When set to low, the heating element in the appliance gives out less heat, and vice versa. If you’re going to leave it overnight or during the day, it is better to leave it on low. Using these appliances is ridiculously easy. You prepare the ingredients and add them to the cooker, making sure it’s filled by no more than two-thirds. Liquid should come about halfway up, or slightly less, depending on what you’re making – bear in mind that it won’t evaporate much. Then you set it to cook and it slowly cooks the food, usually taking between 3-8 hours depending on which heat setting you’ve chosen. When Was The First Version Made? The first brand to come out was Crock-Pot in 1971. Slow cookers gradually grew in popularity throughout the rest of the 1970s, particularly as more women started having careers and spending less time at home. What Are The Best Recipes? Need inspiration? A lot of slow cookers that you buy online will come with a free recipe book or pamphlet to help give you some initial inspiration. Slow cookers are famously good for cooking meat – beef, lamb, gammon, pork, even a whole chicken can be done in the slow cooker. They are also incredible devices for stews, casseroles, curries and hotpots. Another popular choice is overnight porridge. There are countless recipes available, both online and in cookbooks, and you can adapt many traditional recipes for the crock pot too. Which Is The Ultimate Recipe Book? Are Slow Cooker Meals Healthy? Any meal is only as healthy as the ingredients you use to make it. There are several excellent suggestions on the BBC Good Food website. The novel thing about the slow cooking process is that it retains the moisture in food and helps to keep nutrients locked in – rather than losing them, as is common with cooking methods such as boiling, for example. So happily, slow cooker recipes tend to be both delicious and nutritious!